As of 9 December 2016, it’s official: I’m Dr Canan Ziylan, or in other terms: Canan Ziylan, PhD!! It feels incredible and unbelievable at the same time, but it’s mostly a relief that everything went well and I’m very satisfied with the result!! So many exclamation marks, but can you really blame me? =) You can download the full PhD thesis here. For the ones who never attended a PhD defence before, I’ll explain the procedures shortly. 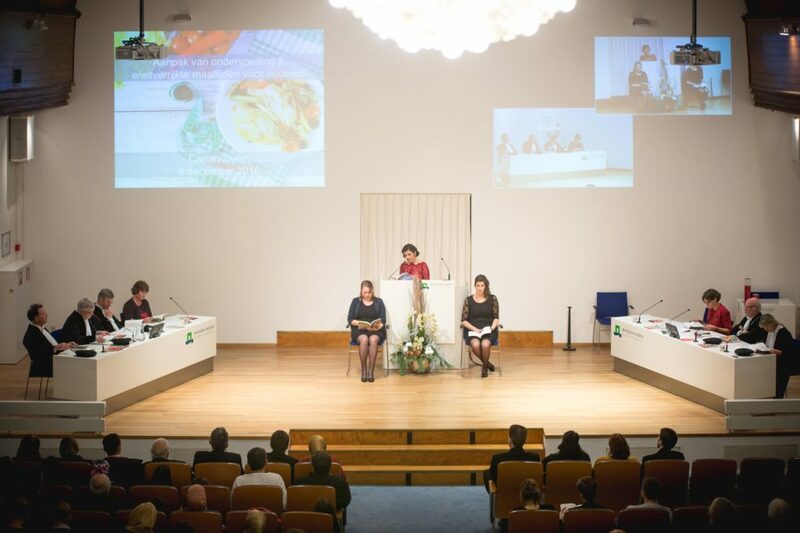 Although I have to say that this is how it went in Wageningen; each university and each country has its own procedures. At 4pm I entered the auditorium with my two paranymphs (lovely assistants) on my side, after which I gave a presentation of the main findings in my PhD thesis. In layman’s terms, so my non-academic family and friends could follow it too. 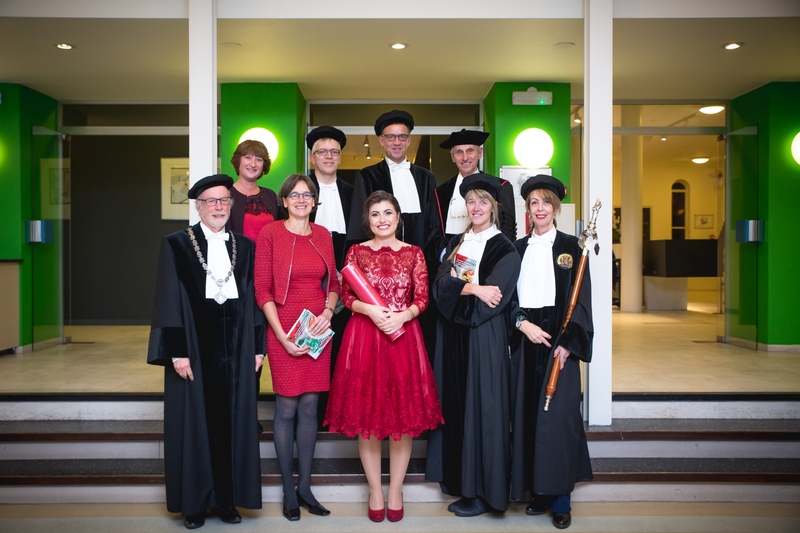 At 4.15 the (acting) Rector Magnificus (Prof Tiny van Boekel), my two supervisors (Prof Lisette de Groot & Dr Annemien Haveman-Nies), and four thesis committee members (Prof Hans van Trijp, Prof Wender Bredie, Prof Jaap van Binsbergen & Dr Liesbeth Zandstra) entered the auditorium. The latter four are also called opponents and are each experts in a field related to my research. They have read my PhD thesis before and prepared questions about it. The opponents asked their questions, of which some referred to specific parts of my thesis, while others were more overarching questions, looking into future implications of my studies. I did not expect to enjoy it this much, but I really did! My opponents had prepared great questions that provided me with the opportunity to showcase my knowledge and ideas for the future. At first, it felt somewhat strange to see my family and friends sitting in the audience, but after only a couple of minutes I didn’t even notice them anymore (sorry guys). It had become a scientific discussion between my opponent and me, which felt very natural. After answering the questions, at 5pm sharp, the beadle entered the auditorium and closed the defence with the famous words: Hora est! At that point, I knew that I had earned my PhD degree, but it was only official after the committee returned into the auditorium after they had a discussion about how to classify my degree. My supervisor Lisette then passed the judgment (judicium): they classified my PhD thesis as good and my defence as excellent, so… happy me! It’s always reassuring if you’re feeling is met by a corresponding evaluation ;-) This meant one thing: signing my PhD degree and officially finalizing the adventure! Finally, my supervisor Annemien started the laudatio, which basically means that someone says super nice things about you and your road towards the PhD defence. I got really emotional by her kind words, partly because she acknowledged the large role my family played in my life. A lot of people mentioned that my acknowledgment touched them, and I’m happy that I could pass my feelings through paper well apparently. My parents were of great support to me, and I especially thanked my grandparents for their effort and sacrifices. For the non-Dutch people, I have translated the last paragraph of my Acknowledgements below. My last tribute to my grandparents, who flew all the way from Turkey to attend my PhD defence. A title is awesome and everything, but where would we be without our loved ones, right? [pagina 141] Ik sluit mijn dankwoord af met de meest toepasselijke opvoeders, mijn oma’s en opa’s. Het maakt me gelukkig dat jullie mijn promotie mogen meemaken. Ik weet als geen ander wat voor moeilijkheden jullie hebben moeten doorstaan om uiteindelijk jullie kinderen en kleinkinderen een goed leven te kunnen laten leiden. Ik hoop dat ieder van ons een steentje bijdraagt aan jullie geluk, zodat het allemaal de moeite waard was. Dit proefschrift is mijn steentje voor jullie. [page 141] I conclude my acknowledgements with the most appropriate educators, my grandmothers and grandfathers. It makes me happy that you can attend my promotion. I know like no other what kind of difficulties you have endured to make sure that your children and grandchildren are able to lead a good life. I hope that each of us contributes to your happiness, so it was all worth the effort. This thesis is my small contribution to you.